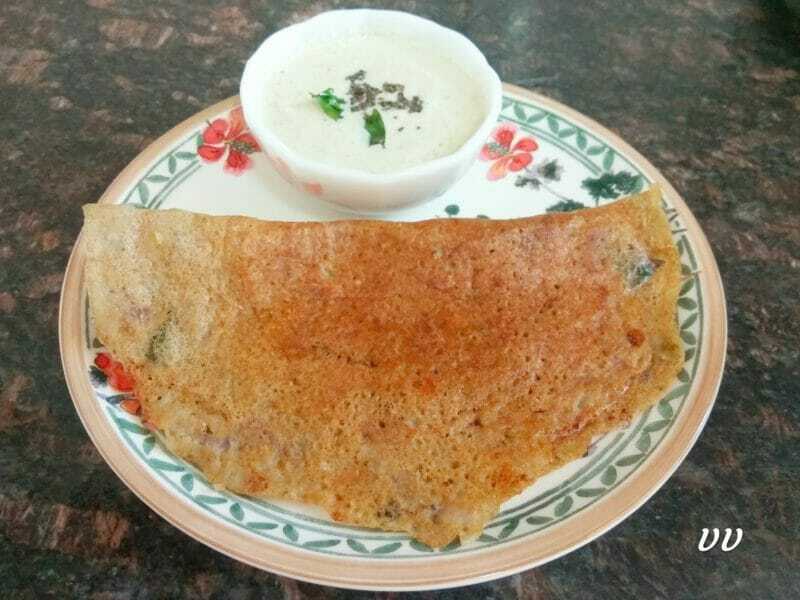 One of my friend shared this dosa recipe using rice recently and it was new to me. I used whole jowar along with whole green moong and urad dal to make it more healthy. It came out very well and the taste was really good, something different from regular dosas. Try this recipe for a flavourful dosa! Thanks Shyamala Srivatsan for the recipe. Wash and soak all ingredients except salt for 6 hours. Using a blender, make a smooth batter. Add salt and ferment for 8 to 10 hours or overnight. Just before making dosas temper 1 tsp each of mustard seeds, urad dal, chana dal, curry leaves, 1/2 tsp asafoetida powder and 2 chopped green chillies in a tbsp of oil. Pour this to the dosa batter and mix well. Make dosas and serve with a side dish of your choice. 1. Whole jowar grains need long hours to soak well. 2. Chopped onions can also be sautéd along with the tempering. It gives a nice taste. can Jowar flour be used instead of Jowar grains? Yes, you can. 1 cup of grains gives 1.25 cups of flour. So measure accordingly.